Selma Ribica leads M-Pesa commercial strategy for international remittances, interoperability and global strategic partnerships in Vodafone Group in London. She has over ten years of experience in business development and strategy roles across different industries (Mobile payments, E-commerce, Real Estate) in both emerging and developed markets (UK, Singapore, Russia, Czech Republic, Italy, France and African markets). Prior to joining Vodafone in 2012, Selma completed her MBA at INSEAD. She lived and worked in seven countries, speaks six languages and is passionate about enabling positive impact of innovative financial services to customers around the world. Interoperability between mobile money operators is a hot topic right now. Various stakeholders have placed it at the top of their agenda, hoping it will prove to be a key to increasing mobile money adoption and advancing financial inclusion. 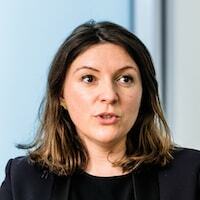 But though interoperability can undoubtedly help extend the reach of mobile money, Selma Ribica of Vodafone Group argues that it can also pose significant risks.